That crazy right-wing conference? Yeah, I was there. Sen. John McCain is the only major Republican presidential candidate who will not address the nation's premier gathering of conservatives this year. Sponsors of the Conservative Political Action Conference, which begins today in Washington and brings together thousands of conservative leaders and grass-roots activists, say the Arizona Republican has "dissed" organizers by attempting to schedule a private reception for attendees after rejecting invitations to speak at the event. "It was a classical McCain move, dissing us by going behind our backs," said William J. Lauderback, executive vice president of the American Conservative Union. Also at CPAC, Ann Coulter proved that Stephen Colbert doesn't have a lock on playing the conservative fool (when will they stop inviting this one-woman John Birch Society to the party). 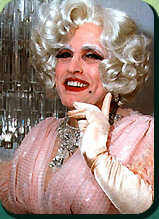 In the end, while Giuliani made a rousing speech on the convention floor, Mitt Romney won the 2007 CPAC 'straw poll' . More here.